By D. Malcolm, P. Eng., and S. Rose, P.Eng., Malroz Engineering Inc. In 1999, the City of Kingston, Ontario, was convicted on seven charges for allowing the discharge of a deleterious substance from a landfill into water frequented by fish. Along with the conviction came a $120,000 fine and a remediation order. There was a personal conviction issued to the municipality's environmental engineer, who received a suspended sentence. 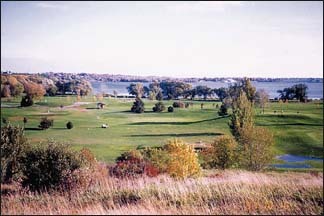 Photo of the site showing its current use as a golf course. This charge and subsequent conviction came as a surprise to the City. The landfill had been closed for 25 years, and had a Certificate of Approval from the Ministry of the Environment for closure of the landfill. Since closure, the landfill had been converted to a municipal golf course. Like every other municipality, the City of Kingston thought the matter had been properly addressed. Although the charges are currently being appealed, there are many lessons to be learned from the Kingston experience so that other municipalities do not find themselves being prosecuted. In the Kingston case the charges were laid under the federal Fisheries Act rather than the Environmental Protection Act (EPA) or the Ontario Water Resources Act (OWRA). Why? Because it is much easier to prove a violation under the Fisheries Act than under the EPA. Under the EPA, one would need to demonstrate impairment to the environment, i.e. that the fish are being harmed (or likely to be harmed) and that the cause of this impairment is from a discharge under control of the party in question. It is sometimes very difficult to prove both these issues and thereby succeed in a prosecution. Some courts have found under the Fisheries Act, on the other hand, one has only to demonstrate that the substance in question will be deleterious to fish, and that the substance may enter a water that fish inhabit. This is a subtle but very significant difference. For example, in those court decisions a deposit of a teaspoon of oil into the Pacific Ocean might be enough to convict under the Fisheries Act, because it is easy to demonstrate that oil is deleterious to fish, and that the ocean is frequented by fish. Once that is proven, the municipality, in order to avoid conviction, would have to show that it acted with due diligence to prevent the release of the deleterious substance. The Fisheries Act does not consider that fish may not inhabit the area where the substance was deposited, nor that the material is rapidly diluted. These same factors would need to be considered under an EPA or OWRA charge, making it is much more onerous to demonstrate that the oil may impair the environment and, therefore, succeed in a prosecution. Another unusual element of the Fisheries Act is the 'bounty sharing' clause. Under the Fisheries Act, fines up to one million dollars per conviction can be levied, with half the fine being shared with the party filing the charge. In the Kingston case, the initial charge came from a private citizen and the court ordered the amount of $60,000 be paid to the informant. The purpose of the 'bounty sharing' under the Fisheries Act is to encourage citizens [ie. the public] to be 'watch dogs'. Whether or not the proceeds from the fine provided an incentive in this case is unknown, however, we do know that in the US, some environmental organizations have sustained themselves by bringing environmental offenders before the courts. Do other municipalities need to worry? Yes indeed. Closed landfills probably exist in the 'backyard' of every municipality. According to the Ontario Ministry of the Environment, there are approximately 4,000 waste disposal sites in the Province. About two thirds of these sites are closed 'landfills', many of them closed prior to 1971 when the MOE required Certificates of Approval for the operation of a waste disposal site. Many older sites were located in river valleys or in swamps close to waterways. For instance, 20 waste disposal sites have been identified in a 60 km2 stretch of the lower Don Valley1. Zwick's landfill in Belleville and Rennie Street dump in Hamilton are two more examples of waste disposal sites located adjacent to waterways. Virtually every municipality has old dump sites operated and closed long before environmental protective measures were employed. A good possibility exists that some of these dumps are discharging a deleterious substance that may find its way to a waterway. So what do environmental professionals need to do? There is no magic bullet. 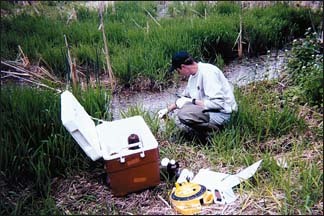 Due diligence may involve the following actions: identify the location of the dumps and landfills within your municipality, characterize their discharges, and conduct toxicity tests on discharges to determine if these are deleterious to fish, and then consider if further study or action is warranted. Before doing so, however, you may wish to seek legal advice. Compliance with an MOE Certificate of Approval is not enough to protect municipalities against charges from either private citizens, environmental groups or the MOE. Malroz assisted the City of Kingston with technical expertise during the trial. 1K. Howard, N. Eyles, S. Livingston. Municipal Landfilling Practice and Its Impact on Groundwater Resources In and Around Urban Toronto, Canada,in Hydrogeology Journal, Vol. 4, No. 1, 1996. See our home page on how to order your subscription. We regret we can only accept orders from Canada and the United States.